What are we expecting from our sailing shoes? An all too obvious question and maybe some of you might wonder why I raise it here, but quite frankly, I´ve been observing this issue for some time and keeping your eyes your will probably notice the same as I did: Most people just don´t wear appropriate sailing shoes. There are Converse Chucks (which I really love wearing), sandals, running shoes and even flip-flops on board. That´s a no-go, if you ask me. Why? Because whilst roaming about on deck first of all a sailor needs thorough foothold, a certain grip of the shoes in all weather conditions, no matter if the deck is dry or wet or even flushed. Good sailing shoes are simply a question of safety at sea. On the other hand, shoes need to be comfortable and nice to be looked at. Sailing is a sport, recreational activity and again, it´s a piece of culture. 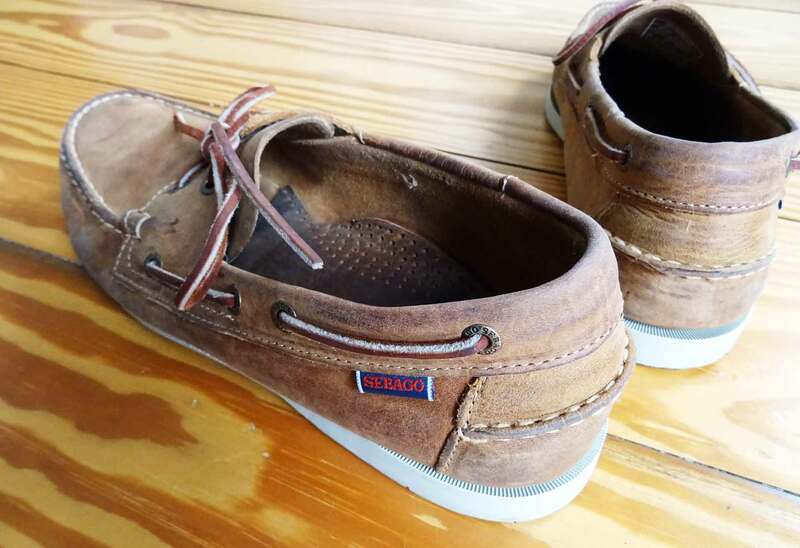 So, when it came to buying sailing shoes for myself, I opted for the classic, the all-time cult shoe, the Chucks of the water: The Sebago Docksides shoes. 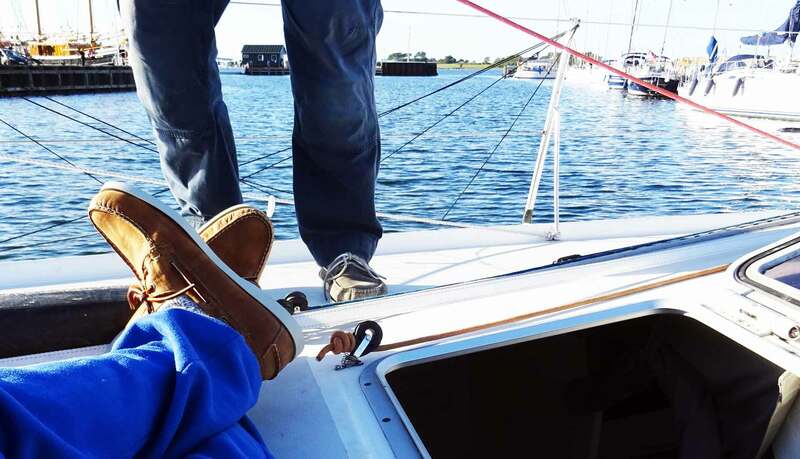 Docksides are the classic product and can be seen at the feet of a lot of sailing fellows. Basically, the shoe hasn´t changed much since Sebago was founded in 1946. It´s a robust, well manufactured slipper made of leather – inside and outside as well. It comes with a slip resistant sole, which is makes it the perfect sailing shoe for almost all weather conditions. Being of white color, the sole is non-marking which will keep your precious Teak decking and white top coats neat and clear from scratch marks and ugly stripes. 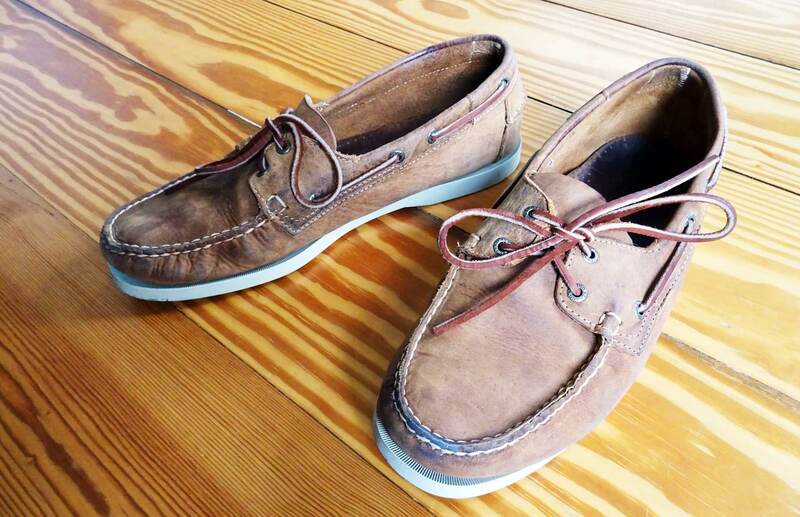 Sebago is an American company with strong roots based in Maine/USA. It has been manufacturing casual marine footwear since it´s beginning and is synonym for high quality shoes. The Docksides can be seen on the feet of a lot of sailors, as well as me-too products by other brands. Well, leather has it´s perfidies too. Most sailors do wear their sailing shoes without socks. After some miles of having the worn Docksides they do fit just perfectly and will be the best companions for the sailor´s feet to think of, but the first days are just awful, as I did experienced by myself too: Huge, huge blisters at my feet, especially at the heels and the ankle! Oh, that did hurt! So my advice would be to buy your brand new exactly to the size of your feet! Too tightyou’re your will bleed, too loose and you will certainly breed a pair of huge and painful blisters. During the first couple of weeks wear your Docksides with socks. Even if it´s hot and your feet are sweating. Maybe cover ankle and heel with patches. After a while the shoes will get their fit and will make friends with your feet – friends forever, as it might be. 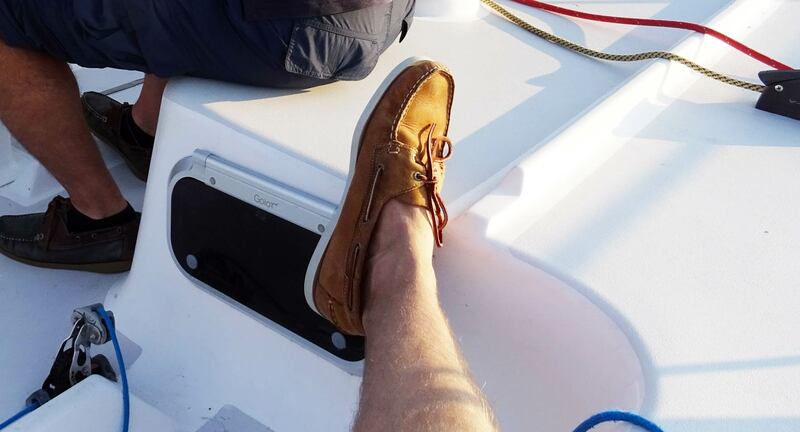 I´ve got my Sebago Docksides a couple of weeks ago and after experiencing the before mentioned teething troubles with blisters and pain I just returned from a 290 mile cruise on a Class 40 sailing yacht and have tested the shoes under various conditions. They are just perfect: Best imaginable workmanship and quality of materials. The soles are definitely non-slipping and won´t leave any marks on all kinds of decking material. I think the high price of some 140 Euros is worth the quality of the product, although there are some very competitive offers by similar products in a more priceworthy category. Nevertheless, a Docksides is a Docksides and it´s just a great feeling to have these shoes on my feet.